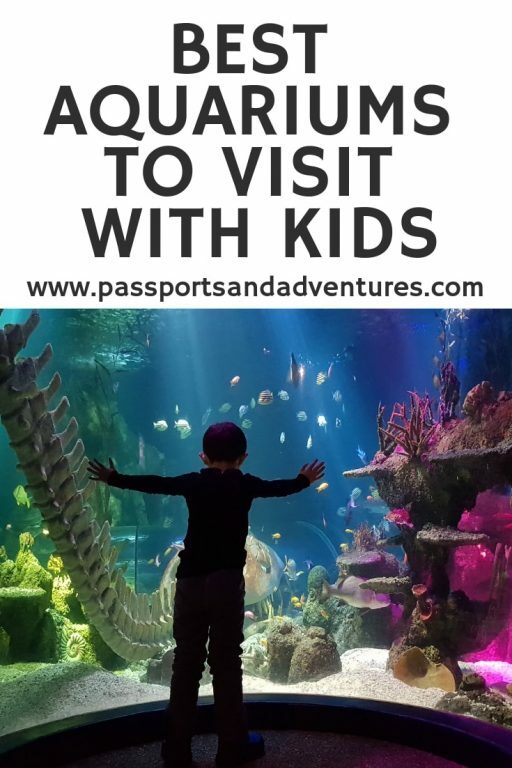 Along with family-friendly museums and castles to visit with kids, one of the other things we always try to add to our itinerary when we visit cities with our son is aquariums. Let’s face it, most kids these days have seen the Finding Nemo films. Now, our son has watched Nemo to a point but it is the Finding Dory film that has caught his attentions and sparked his interest in fish. So, to ensure we get a good mix of both adult sightseeing and fun things for kids, we usually ensure we can include castles, museums, zoos and also aquariums on our city break itinerary. And we’ve been lucky that we’ve been able to visit some great ones. Our personal favourite to date has been the Oceanario de Lisboa, in Lisbon, which is rated as one of the best aquariums in the world according to TripAdvisor. Not only can you see fish off all shapes and sizes, you can also learn about conservation and the devastation plastic is having on our oceans and the marine life that inhabits it. But I’ll let one of the bloggers tell you more below. In this section you’ll find some of the top aquariums to visit within Europe. 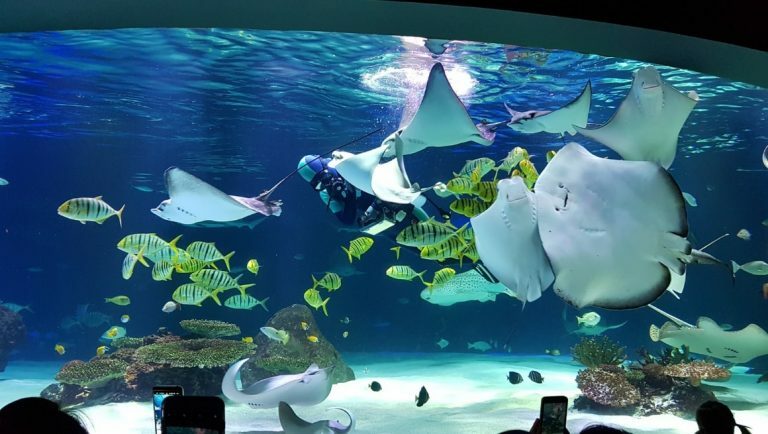 The top 10 aquariums to visit in the world, according to TripAdvisor (2019), include three European aquariums, two of which has been suggested below. Be ready to be immersed in an underwater adventure at the Sea Life London Aquarium. As you weave your way through the aquarium, you will see sharks, pet a starfish, and walk through a tunnel with stingrays swimming around you. 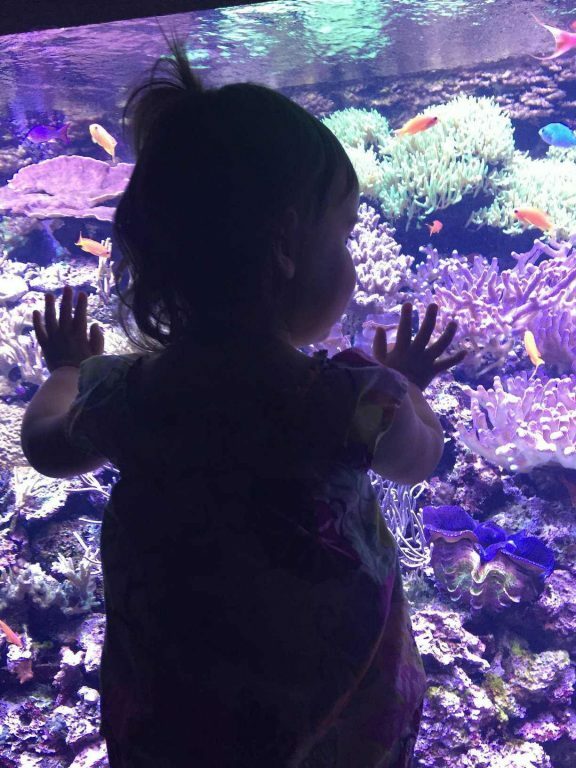 The Aquarium is ideal for all ages. There are interactive exhibits and many sea creatures to stop and take a minute to get to know. In 2017, a fantastic jellyfish exhibit opened. Many people fear jellyfish because of their notorious sting, but they are mesmerizing to watch as they swim through the water. Be sure to notice the upside-down jellyfish, also known as the sun-bather. It can swim, but it prefers to stay upside down and sit on the sea bottom. There is an arcade at Namco Funscape and a McDonalds as you exit the aquarium. There are many other family-friendly attractions in the same area as the aquarium. You can even buy combination tickets that will save you money — places like London Eye, The London Dungeon, Madame Tussauds London and Shrek’s Adventure. If you have any energy left, walk across the Westminster Bridge and take a family group shot with Big Ben. The Westminster tube station has easy access from Big Ben and can take you to other exciting points in London. An enjoyable day out in London with so much to see in such a small area, from underwater at the aquarium to a bird’s eye view on the London Eye. L’Aquarium de Paris, that is, the Paris Aquarium is truly a gem, especially if you are travelling with kids. It is the largest tank of Paris, with more than 500 aquatic species. This includes a great variety of jellyfish from different parts of the world, sharks, sea-horses among others. There are interactive shows, documentary movies and a lot of interesting general knowledge trivia about aquatic life. The presence of children of all ages running around with excitement and curiosity rekindles the child in you. This amazing experience makes the entry fee of 20 Euros totally worth, however, it is completely waived off if you hold a Paris Pass. The Paris Museum is a 5-minute walk from the famous Place du Trocadero, so there is no excuse for missing it. We are glad that we included it in our 3-day Paris itinerary and recommend you to do the same. The facility is open till 7 pm, so you can visit it in the evening after the museums are all closed. The Atlantic Sea Park, located in Alesund, is one of northern Europe’s largest and most unique sea water aquariums. The aquarium showcases life along the Norwegian coast and in the Atlantic Ocean. Facing the ocean and Norwegian fjords, visitors can observe, learn and experience life at sea. Within the aquarium are ten large tanks containing different fish, algae and marine animals from this part of the world. The largest aquarium tank (one of the largest sea water tanks in Europe) is home to many species of large cold water fish, originating from the area. There is a daily feeding show at this tank every day, throughout the year. The activity pools are a great place to head with kids. Here you can touch and pick up various marine species, including star fish, crabs, sea urchins and lobsters. Children can also try their luck at catching a crab with a fishing net. Outside, visitors will find areas with seals, penguins and beavers. The seals and penguins are fed daily which is interesting to watch. Check out the feeding times on arrival. There is also a cafe on site serving food and drinks. My favourite aquarium is the Lisbon Oceanarium (Oceanário de Lisboa) which is one of the largest aquariums in Europe and beautifully done. We have visited with our three children on a number of our trips to Portugal and it’s always a big hit, no matter what their age. The huge tanks make you feel as though you’re actually in there with the sealife and the experience is put together so well, you wind your way through the building seeing so many beautiful fish and underwater creatures. Set in the vibrant Parque das Nações there’s lots going on in the area with restaurants and attractions so it’s the perfect day out with kids in Lisbon. The showstopper of the aquarium is a 1000 metre square tank so you can see various levels of the ocean in one. It is such a clever set up and amazing to see the elusive sunfish swimming past too. We’ve been to numerous aquariums around the world but Oceanário de Lisboa really does stand out as having something special. The Haus des Meeres (House of the Sea) – Aqua Terra Zoo in Vienna, Austria must be the only aquarium in the world that’s in an old WWII anti-aircraft tower. But it’s not only this interesting historical background that makes the aquarium worth including in your itinerary when visiting Vienna with kids. More than 10,000 creatures live in the Haus des Meeres – Aqua Terra Zoo in Vienna’s Esterházy Park. This includes schools of colourful fish which surround you in the Atlantic Tunnel, a huge fish tank filled with 500,000 litres of water. Some sea and freshwater creatures which can we seen in this and other aquariums are piranhas, sharks, corals, and sea turtles. For something other than fish, there is a House of the Tropics with birds, monkeys and fruit bats. Or how about watching crocodiles and snakes in Krokipark? A highlight of a visit to the Haus des Meeres – Aqua Terra Zoo is the 360° view of Vienna from the open-air terrace on the 9th floor. You can also try some Viennese coffee and cake in the cafeteria on the 4th floor. 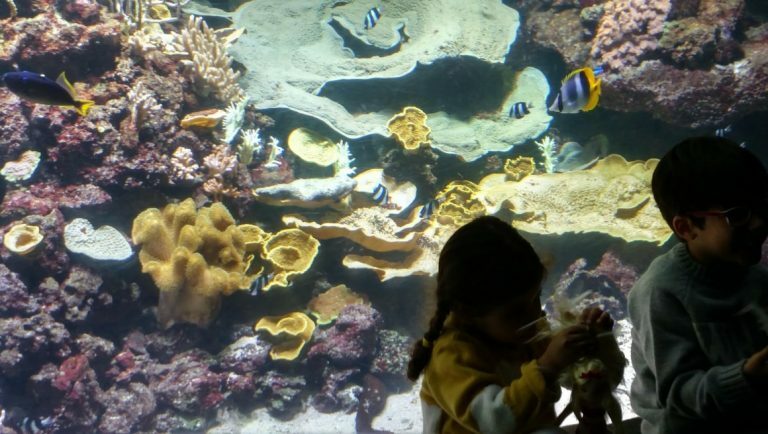 We visited the aquarium of La Rochelle when our kids were aged 5 and 7 and to say that they loved it would be an understatement! Their excitement was palpable as they darted from one exhibit to the next. This beautiful, modern aquarium is located in the pretty seaside town of La Rochelle in western France and is one of the largest privately owned aquariums in Europe. You’ll find everything from a jellyfish tunnel, a shark tank, a turtle area and of course, a tremendous variety of species from around the world. Little ones will love playing in the caves where they can pop up as though in the actual fish tanks. Allow a couple of hours to get round the aquarium and aim to visit in the morning as it does tend to get very busy in the afternoons. We recommend that you buy your tickets online to avoid having to queue and to get an extra 2€ off if you buy for a specific date. There’s a great restaurant on the top floor with lovely views across the town. 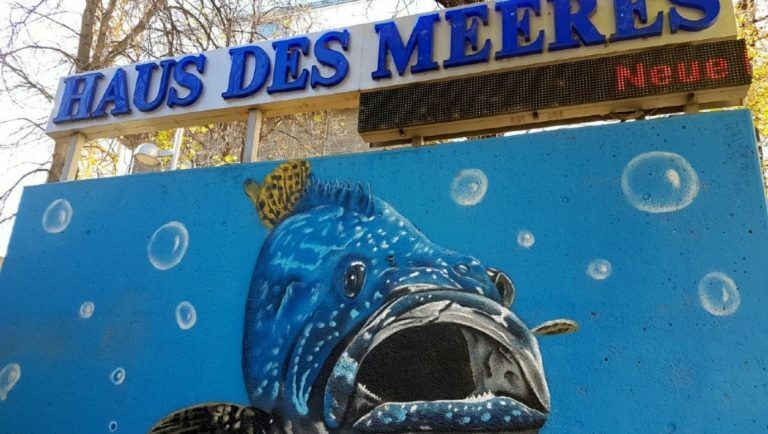 There are so many things to do with kids in La Rochelle and a visit to the aquarium is an absolute must! The Aquarium in Valencia (Spain), called Oceanogràfic, is the largest centre of this kind in Europe, and without any doubt it’s one of the most essential things to visit in Valencia. It’s part of the City of Arts and Science (Ciudad de las Artes y Ciencias) and was designed by the Spanish architect, Santiago Calatrava. For its visitors, this giant aquarium complex offers exhibitions of all main marine ecosystems of the world from the Arctic or the Antarctic, through Mediterranean ecosystems to tropical waters such as the Red Sea. The area covers 110,000 m2 of space and has 42 million litres of water. There are more than 500 different species to meet in the aquarium. 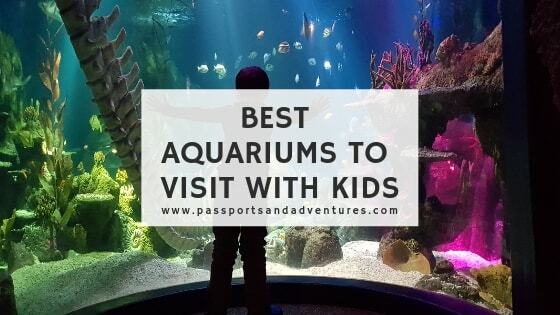 The diversity of the Aquarium is very ample, and kids especially enjoy the encounter with different kinds of penguins, belugas (only exhibited here in Europa) and of course seahorses, colourful fish and different kinds of sharks. 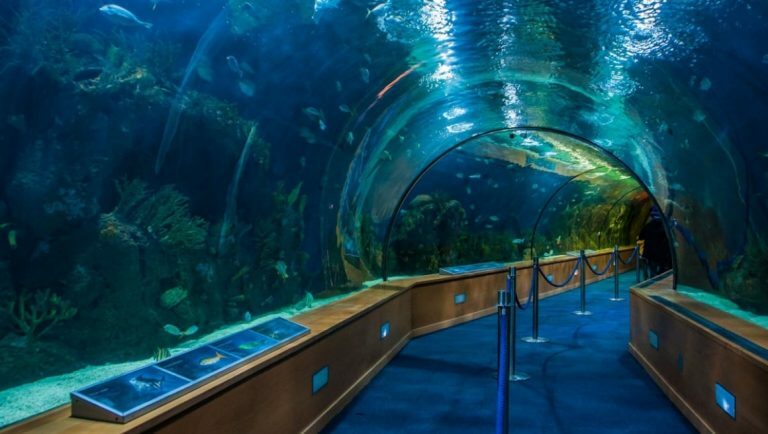 Apart from the different exhibition rooms, the most amazing place is the large glass tunnel that lets you see giant sharks and all different kinds of sea creatures “from the inside”. Apart from the exhibitions, children are invited to take part in all kinds of interactive activities. Den Blå Planet in Copenhagen, Denmark is a great place to explore life under the water. It is often called the Denmark National Aquarium, and is the largest aquarium in Northern Europe. It is not only a fun place for families to spend an afternoon, but it offers many educational opportunities. The aquarium is divided into several different areas including ocean, rainforest, and Nordic river life. Kids can watch sea otters splash about and play, or view hammerhead sharks swim in the aquariums largest tank. You can even walk through a glass tunnel surrounded by sharks. 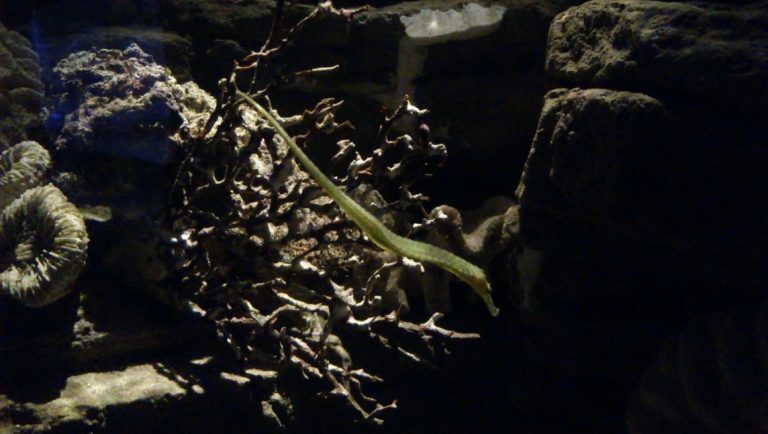 In the rainforest section of the aquarium, you can view life both above the water and below the surface. From above, you’ll be able to peer down into a tank of red piranhas. Walk down the steps for a closer look at the sharp teeth of the predatory fish. In this section you’ll also be able to see the arapaima. Known as the giants of the seas, scientists believe this freshwater fish has been around since the age of dinosaurs! Finally, if visiting Copenhagen with kids, you can work in a regional educational component to your aquarium visit. In the Nordic region of the aquarium, you can view and read about some of the fish and wildlife that live in northern Europe’s rivers, lakes, and seas. It’s a great way to help kids appreciate the uniqueness of the region. The National Marine Aquarium in Plymouth in the UK is a charity DEDICATED to marine conservation. Set up solely for the purposes of education, conservation and research, the aquarium is also super kid friendly. Exhibits on conservation are tactile, interactive and fascinating and are everywhere, matched with colourful facts & figures painted on the walls. The entire place is geared towards education, showcasing the wonders of our oceans, the perils sea creatures face from humans and how we can make a change. From highlighting local dangers such as the fragility of ‘super’ seagrass, or explaining the marine food chain, to championing the shark species (encouraging us to defend not destroy) the National Marine Aquarium hugely impressed me. The EDDYSTONE REEF zone (the Eddystone Reef is a reef 19 miles off the coast of Plymouth) boasts the largest single viewing panel in the UK. Like a mammoth movie screen, the viewing panel is simply matched with rows upon rows of chairs to quietly sit and watch – very therapeutic, plus there’s a huge table for kids to colour in ocean scenes. The National Marine Aquarium even has its own Ocean Lab. Here you can peer live at marine scientists going about their work. Large information boards detail the different ways in which marine scientists carry out research and monitor the impact from natural occurrences and human activity. The Atlantic Ocean tank, almost at the end of the Aquarium is where you’ll find the sharks. This is the deepest tank in the UK, with more than 2.5 million litres of water. As you enter the zone you’ll walk 10 metres under the tank. Above you through glass panels you’ll be able to view rays, barracuda, lemon sharks and sand tiger sharks glide over you. The Atlantic Ocean zone focuses on dispelling the many myths associated with sharks and to drive home the message of why sharks are so important to our planet. L’Aquàrium de Barcelona is a must visit place if you are traveling to Barcelona with kids. It was one of the highlights during our visit. The Aquarium is located in Port Vell, which is a lovely open place for a walk by the water and you may be lucky to see some big yachts moored there as you approach. There is a large collection of marine life and a large tank where you can spot the fish and sharks from the 80 m long tunnel below. They have a good supply of fish (over 450 species) and both Nemo and Dory can be seen in the same tank. It is super fun for the kids to try and spot them. There are some sand tiger sharks, sandbar sharks and many types of other fish, rays and marine life that make it an interesting visit. The interactive exhibition is very informative too. I definitely recommend the L’Aquàrium de Barcelona if you are visiting the city as it is a fun activity for children of all ages, and parents will enjoy too. Try and plan your visit around feeding times, which are posted on their website. The TripAdvisor top ten aquariums in the world includes no less than 5 aquariums across both America and Canada. That’s half of the top aquariums in the world located on one continent. In this section you’ll find the best aquariums in the US as suggested by my fellow bloggers. 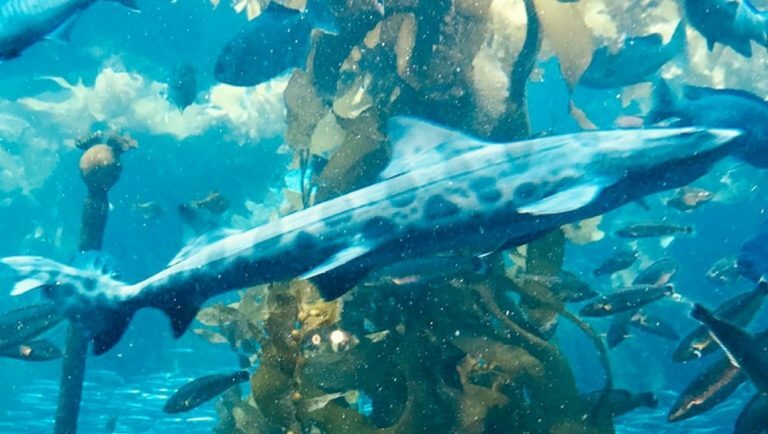 Widely regarded as one of the best aquariums on Earth, the Monterey Bay Aquarium in California is one of Big Sur’s star attractions and a centerpiece of the old fishing village, Cannery Row. It was the first in the world to exhibit a living kelp forest and pioneer projects in marine biology and ocean conservation. 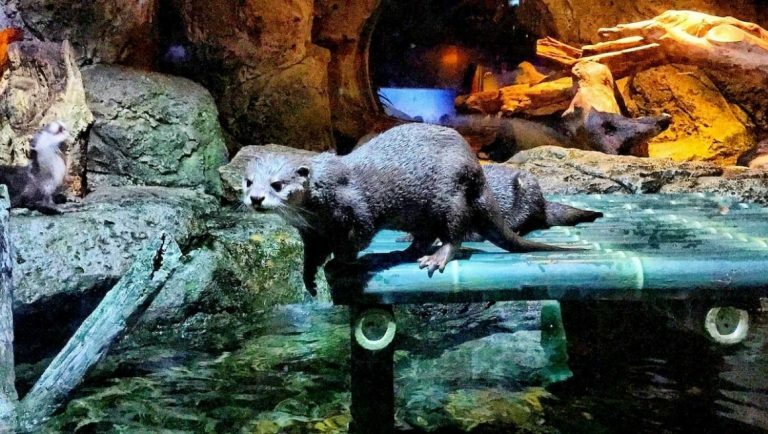 Kids of all ages will love the playful otters, mesmerising jellyfish, fanciful penguins, and touch tank but it’s the real-life outdoor marine habitat that steals the show. Walk through a wave tunnel to see animals that call the Pacific Ocean home as the waves gently lap at the sandy shore. You never know who might show up from dolphins and sharks to humpback whales. Monterey Bay is part of a protected National Marine Sanctuary that stretches for almost 300 miles with depths as deep as the Grand Canyon. Not much is known about its underwater world, making it that much more intriguing and mysterious. The museum gets very busy so try to come early or late in the day and avoid weekends if you can. 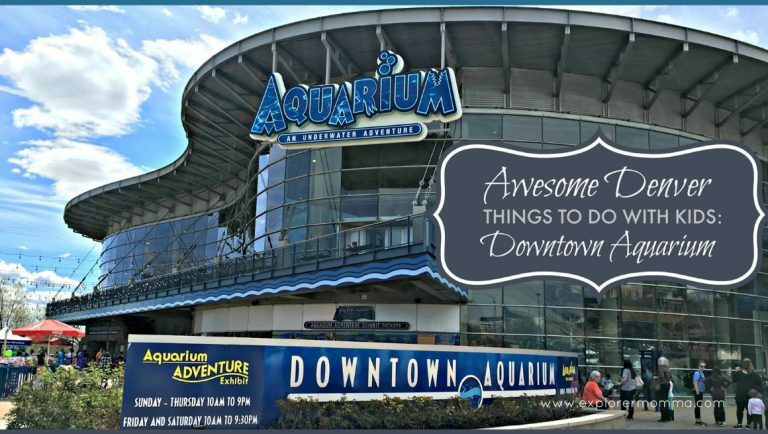 Located in the historic West End district of Dallas, the Dallas World Aquarium offers lots of engaging activities for kids and is one of the best Aquariums. As the name suggests, the aquarium houses exhibits that feature animals from around the world: Borneo, Fiji, Indonesia, Japan, South Africa and many more. Leafy and Weedy seadragons and clownfish are popular with the kids here at the Aquarium. The seven-story Orinoco Secrets of the River exhibit highlights the unique bio-diversity of the South American rainforest ecosystem where you can see two-toed sloths, parrots, toucans and other vibrantly coloured birds. Make sure to check out the Flooded Forest and Ancient Mayan exhibits, which are two of the most popular among visitors to the aquarium. You can combine it with a visit to the Perot Museum. The Pittsburgh Zoo and PPG Aquarium, located in Pittsburgh, Pennsylvania, houses one of the best aquariums for young kids. The aquarium is nestled in an expansive building in the middle of the Zoo and holds a large variety of water species. Upon entering the aquarium from the upper level, there are several tanks with the most colourful fish at eye level for kids of any height, along with freely swimming penguins in an enclosed, ice-cold dwelling. 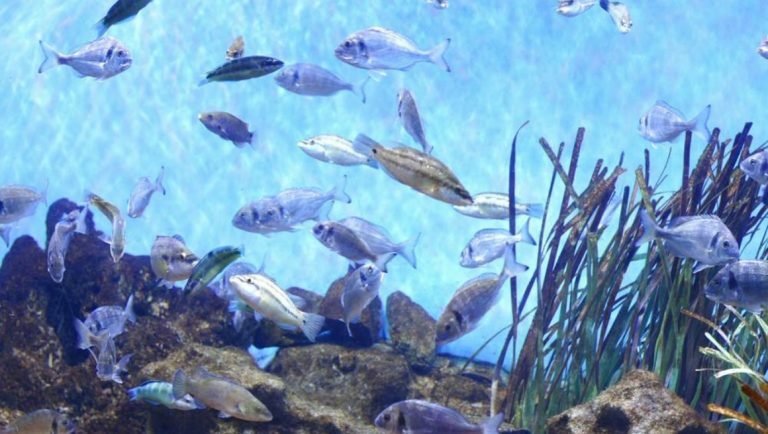 In addition to a large variety of fish, the upper level of the aquarium holds a variety of other sea life including turtles, lobsters, sea anemones and sea horses. There’s also a two-story “shark tank” that’s a favourite of kids and holds a variety of sharks that they can get up close to behind the glass. From the 2nd floor of the PPG Aquarium, there’s a winding path along several fish and plant species taking visitors to the 1st floor. This main floor of the aquarium has one of the best spots for little kids, with a hands-on aquarium where kids can safely touch stingrays, fish and coral. There’s also a tunnel surrounding the “touch tank” that’s just their height with open views of the sea life all around. 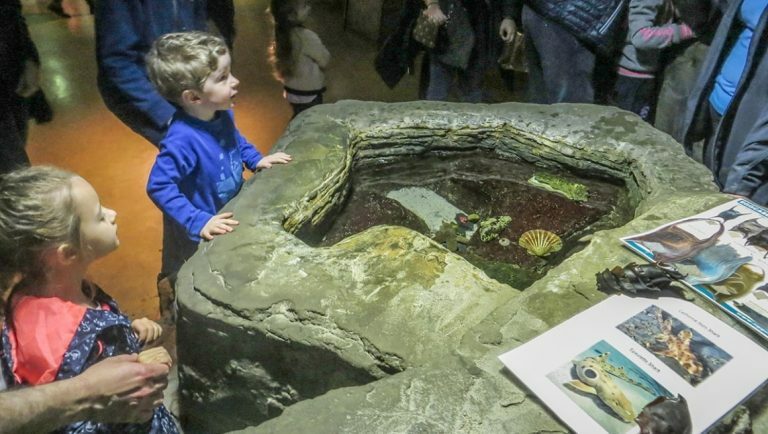 With the Zoo open all year long, the aquarium is also a great place to get a break from the outdoors and allow children to openly explore in an enclosed space. Plus, if you’re visiting during the winter months, the aquarium is at the start of “Penguins on Parade;” an event that shouldn’t be missed. 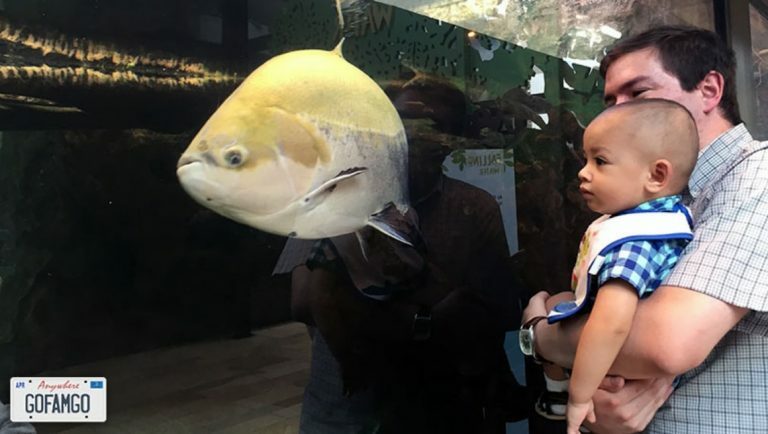 While the PPG aquarium may not be as large as some stand alone aquariums, the focus on kid-friendly features makes the Pittsburgh Zoo & PPG Aquarium a must see for kids if you’re in the Pittsburgh area. 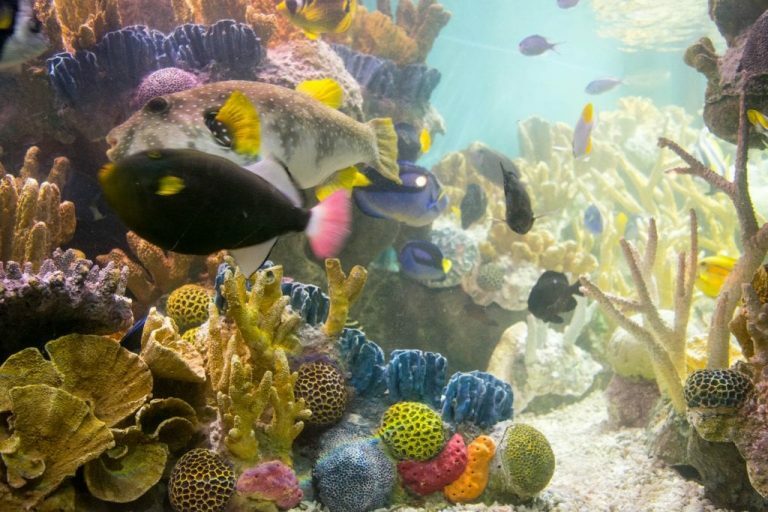 Boasting a four-story ocean tank, multiple penguin exhibits, and even whale watching trips, a visit to the New England Aquarium is easily one of the best things to do in Boston with kids, and children of all ages are sure to find something delightful behind its doors. Whether you have school-age children interested in signing up for an animal encounter (if you don’t want to book a special experience, the shark and ray touch tank is available to all), young tots who want to watch the penguins be fed twice a day (a joy for all ages, truly), or simply a tired family who wants to relax in front of an educational IMAX movie, there’s something at the New England Aquarium for you and your kids. Located directly along the Harborwalk in Boston, the aquarium has an enormous focus on education and conservation, even going as far as using the local ocean water in some of their exhibits. The Florida Aquarium is located in Tampa, FL and is a wonderful aquarium for kids (aged 2-8) with its touch tanks, Florida estuary with playful sea otters, and a glass tunnel where you can watch sharks swimming above and all around you. We also enjoyed their behind-the-scenes adventures such as visiting with penguins! It’s the only way to see the black and white “birds” and you’ll get to touch, ask questions and take photos with your new friends. If you come when it is sunny and warm outside, be sure to bring a bathing suit, water shoes and a change of clothes because the splash pad outside is great for kids to burn off some energy! There is a bar close by for parents and a cafe with indoor and outdoor seating when it’s time for lunch. If your kids are a Blippi fan, be sure to check out his YouTube video at the Florida Aquarium! Want to check out more things to see and do with kids in Tampa, Florida, head over to my blog page for all the info! The Georgia Aquarium is ones of the best aquariums in the world. It is also the second largest with over 10 million gallons of salt water. The aquarium, located in the heart of Atlanta, is home to more than a hundred thousand animals. It is a fantastic aquarium to visit with kids because of the sheer volume of attractions and unique marine life. The Georgia Aquarium is the only aquarium outside of Asia that you can see whale sharks. While there is some controversy to this, they are housed in a 6.3 million gallon tank with sharks, manta rays, eels, and other marine animals. The Ocean Voyager is the main viewing area where families can see thousands of fish from various viewpoints, windows, hallways, and floor to ceiling glass. I advise that people see this exhibit first, as it is the most popular and gets crowded later in the day. The Cold Water Quest is another very popular exhibit, as it features the friendly beluga whales. Kids can interact with the whales from a huge glass below the water or see them from a second story overlook. There are sea lion and bottlenose dolphin shows, animal encounters, behind the seas tours, and a 4-D theater. 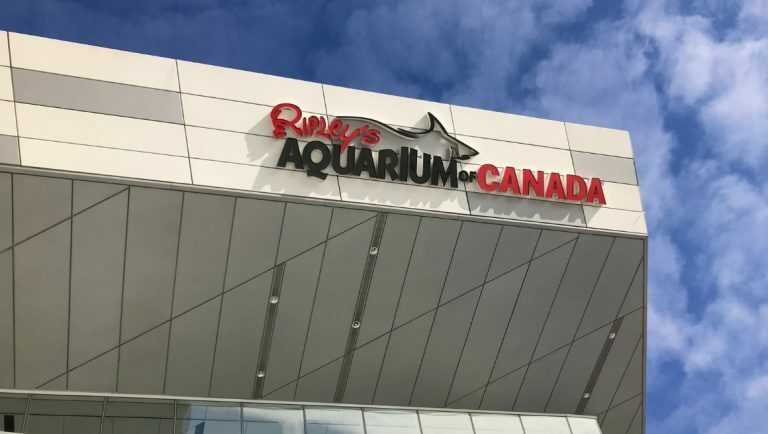 I recommend visiting this fantastic aquarium with kids of all ages, as there is something to enjoy for everyone in the family. Also, you should buy tickets online in advance to save time and money. 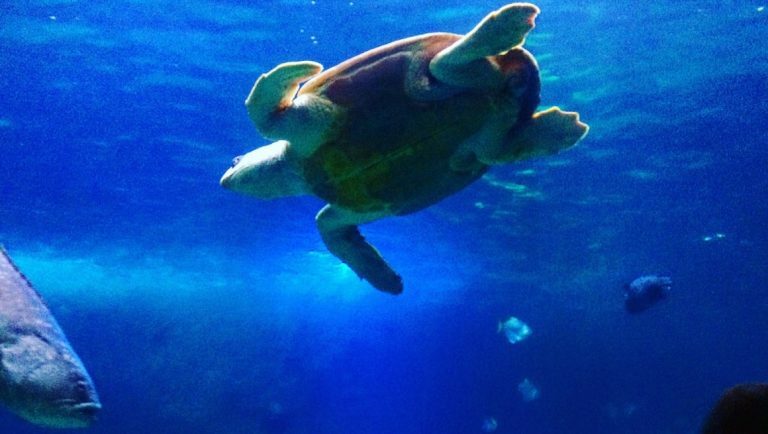 The Georgia Aquarium is a must-do attraction when you are visiting Atlanta with kids. The National Aquarium in Baltimore, Maryland is the official national aquarium of the United States. 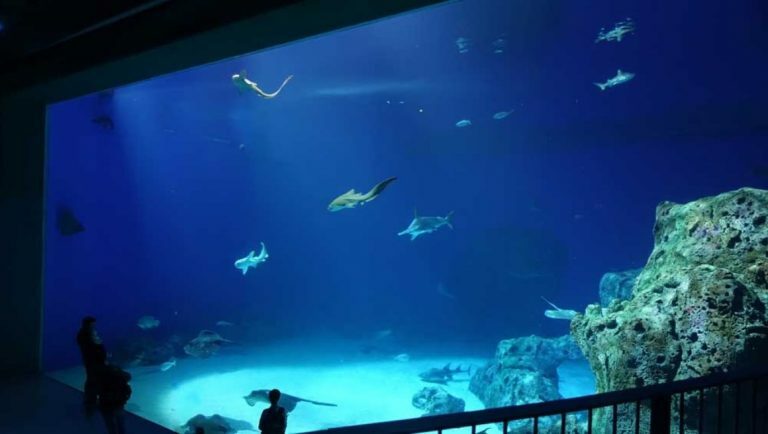 Featured as one of the top three aquariums to visit in the U.S. the National Aquarium holds over 17,000 fish, reptiles and animals and boasts popular exhibits including the Atlantic Coral Reef, featuring numerous sharks and manta rays, as well as an escape to Upland Tropical Rain Forest. An award-winning exhibit, the aquarium’s Australia: Wild Extremes, features more than 70 of Australia’s unique species including freshwater crocodiles, snapping turtles, spiny lizards, python snakes and unique birds such as the laughing kookaburra, which produces sounds imitating monkeys in the jungle! A three-story waterfall greets families when they enter the aquarium and provides for a refreshing experience. Head over to Blacktip Reef where your kids will love trying to poke at bubbles illuminated in a floor-to-ceiling bubble. Dolphin Discovery is one of the aquarium’s best attractions and a favourite for kids who want to sit in the amphitheatres “splash zone.” If your child is 8 or older, be sure to take part in the Dolphin Encounter where your kids can experience firsthand the relationship between trainers and the bottlenose dolphins. The top of the aquarium has a snack area, though not always open, it provides for a quiet retreat and sweeping views of Baltimore’s Inner Harbour. Several restaurants at the aquarium are great stops for lunch or consider getting food in many of the aquarium’s surrounding restaurants. 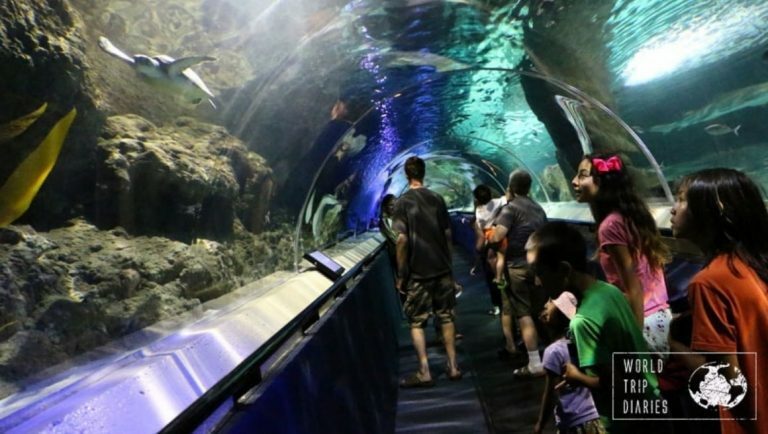 Important tip: Due to the unique architectural layout of the aquarium’s interior including numerous moving walkways and escalators, strollers are unable to be accommodated inside for safety reasons. If you do bring one inside, it will be stored for you and a child front or back carrier packs will be provided for you, or you can bring your own! Right on the waterfront in Seattle, Washington you will find the Seattle Aquarium. The aquarium is very accessible as there are parking areas all around it, and is easy to walk to from many other Seattle landmarks. This aquarium is perfect for all ages, and my 3 and 7 year old love all of the exhibits. The aquarium is the perfect size, and makes for a great thing to do in Seattle for a few hours. My kids particularly love the tide pools area. It is here where you can get your hands wet and touch certain sea creatures that are found in the Puget Sound. Another part of the aquarium that is a big hit with the kids is the Giant Pacific Octopus. I think our family’s favourite exhibits in the Seattle Aquarium are outside where the otters and seals can be found. They are so cute and we could totally watch them play for hours! The Seattle Aquarium is a perfect place to spend a few hours in Seattle. The location is perfect as it will allow you to see many other Seattle sights all within walking distance as well! Ripley’s Aquarium of Canada is a fantastic aquarium that is perfect for kids of all ages. We have visited this aquarium 3 times and each time have discovered something new to love. 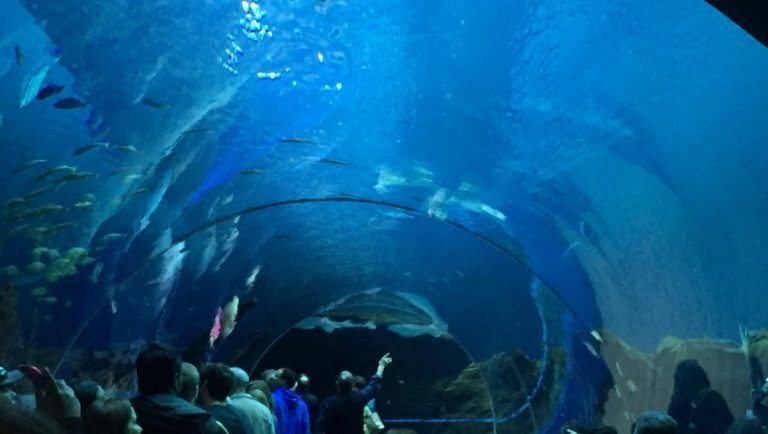 One of the biggest highlights has to be the exciting ‘Dangerous Lagoon’ which is an underwater tunnel with a conveyor belt that takes you directly under a variety of different shark species. For our kids, who are both under age 5, the discovery centre was also a big hit! In this area, there are lots of hands-on activities including a touch exhibit where kids can touch the skins of sharks, rays, and other awesome creatures. Finally, my favourite exhibit has to be the Planet Jellies exhibit. Watching the Jellyfish move fluidly throughout the water is an amazing sight! If you’re headed to this aquarium, you’re going to want to avoid the lines purchase tickets in advance online. Also, avoid peak times by heading to the aquarium earlier or later in the day (peak times are between 11-4pm on weekends and holidays). For the best deal, consider the Toronto City pass. With this pass, you can experience 5 of Toronto’s best attractions for one low price. 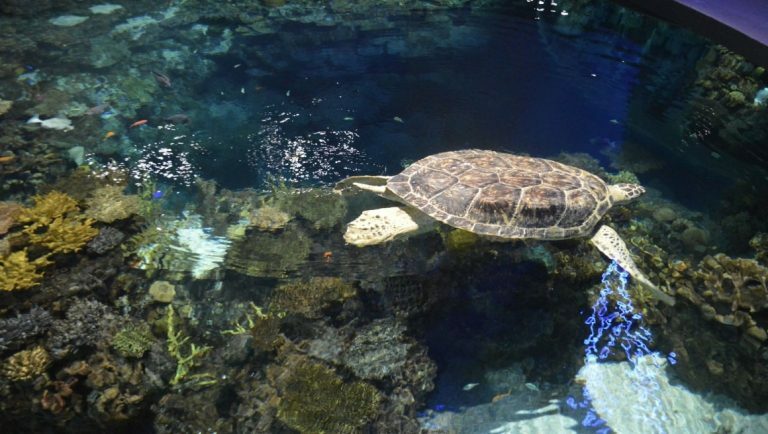 A visit to Chicago will lead you to one of the world’s largest indoor aquariums. The Shedd Aquarium is a public aquarium located on the Museum Campus in Chicago, IL. It is one of the popular choices for families to do when in Chicago with kids. The aquarium houses exhibits that showcase the diverse species of marine animals from across the world. Watch and compare small to large fishes like piranhas and sharks, feel a stingray swim under your fingers, learn about beluga whales, or dress and play as penguins. From the youngest to the oldest members of your family, there is something to enjoy and learn in Shedd Aquarium. It is also more than a destination as Shedd Aquarium has been in partnership with several alliances to help preserve, rescue and rehabilitate animals, not just marine life. Lines for admission to the aquarium are known to get long. We recommend to purchase tickets online ahead of time or use a Chicago CityPASS or a Go Chicago Card which could include a VIP entrance to the Shedd Aquarium and has other passes to famous attractions in the city. The Denver Downtown Aquarium is one of our favorite places to visit in Denver, Colorado. My kids are now 6 and 10, and both marine-life loving kids are fascinated by tanks of fish, the hands-on aspects of the exhibits, and even a face to face run-in with a tiger. Why do we love the Denver Downtown Aquarium? There are over 500 species of animals with tank exhibits holding more than a million gallons of water. My son becomes mesmerised by the giant shark tank until the small shark-lover recovers himself and starts to lecture on their differences. The Under the Sea exhibit is a fun one as you literally walk through a gigantic water tank. You walk under the sea, through an archway to spot the manta rays, moray eels, coral, and variety of fish on all sides! We love the interactive exhibits too. My daughter is all about petting the rays, horseshoe crabs, and small sharks. On one visit a volunteer even had her feel the suction cups of an octopus! But the most exciting thing for a young girl is to see the Mystic Mermaids show. Stop at the Aquarium Restaurant where your table is right up against a wall of water. You’ll spot a yellow tang, clownfish, and mermaids! Yes, the mermaids do a show right next to you while you eat. My big tip is to sign up for the email club, especially if you’d like to cut down on some of the costs. Personally, I’ve received coupons for half-priced admissions, restaurant discounts, and more. Also, they’ll let you know if there are any special events happening during your visit. As a family, we highly recommend the Denver Downtown Aquarium, and visiting Denver in general. Have a fabulous time! Of the top 10 aquariums in the world on TripAdvisor, two can be found in Asia and the Middle East. And there are more besides these two top rated aquariums to be found in the regions, particularly Asia. Let’s take a look at which awesome aquariums my fellow bloggers have suggested in this region of the world. Osaka aquarium, or Kaiyukan, is one of the largest aquariums in the world. It’s set inside an enormous building down by Osaka’s harbour and near to many other super fun things to do. 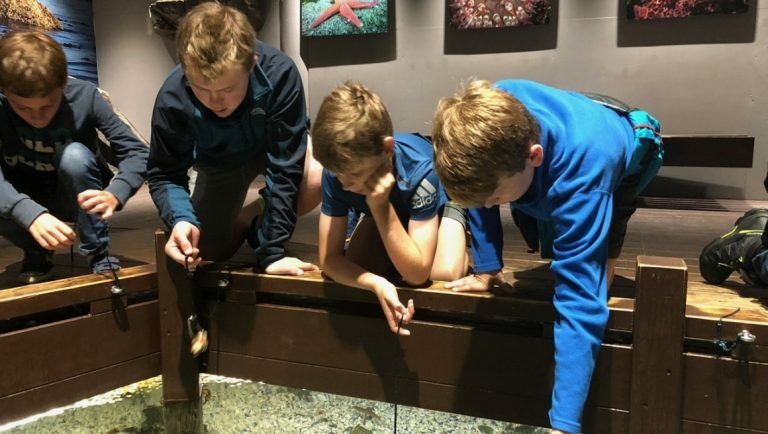 Inside the aquarium you can explore diverse marine habitats, from the arctic to tropical reefs, rivers and harbours, all of which are found around the Pacific Rim. There’s a section for Japanese rivers with adorable otters, and the seals and dolphins will delights kids of all ages. The star attractions of Kaiyukan are its whale sharks. They’re displayed proudly on the exterior of the aquarium building, and the aquarium is shaped around their enormous tank which they share with rays, hammerhead sharks and other fish. It’s a mesmerising sight – whale sharks are the largest fish in the world and so this tank is cavernous. Spiral walkways past all of the tanks allow you to get a different perspective on each of the tanks as you follow the route through the aquarium, so you can see the surface life as well as deeper below the surface. Near the end of the route you’ll find special exhibits, as well as some cute penguins, creepy spider crabs and eerie jellyfish. Kaiyukan is aimed at kids of all ages. Aim to arrive as early as you can as the aquarium can get really busy even in the off season. Tickets cost 2300 yen for adults, and you can get them online or on the door. One of the best things do in Bangkok with kids was a visit to Sea Life Bangkok Ocean World – the largest Aquarium in South East Asia. That means five million litres of water and four hundred different species. We read on Google that people usually spend 3 hours on average. I had to drag my girls out of there after five! After that time they still wanted to see more shows – but there just wasn’t the time. Probably their favourite was a petting pond where they could touch starfish and watch otter feeding. Mine was the 270-degree underwater tunnel and the ‘Open Ocean’ with its shark collection. And there are lots of other activities for additional fees (prices below). Sea life is located in a Siam Paragon – big shopping mall. There are several cafeterias within Sea Life, but my recommendation is to go out into the mall which has an amazing food court and restaurants. These are located one floor above the Sea Life entrance. We ate very well there. Seoul has 3 main aquariums, the 63 aquarium, COEX aquarium and Lotte World aquarium, all located south of the Han River. The 63 Aquarium is located in the iconic 63 Building, which used to be Seoul’s tallest tower. The aquarium is a great place to visit, especially with kids, as there are many shows like the mermaid show, otter feeding, penguin feeding, seals explained and other fish feeding shows. Apart from the aquarium, the 63 building houses a shopping mall, an IMAX theater, many restaurants and an indoor viewing platform on the 59th floor. Tickets to the aquarium include an entrance ticket to the viewing platform. From the top floor in the tower, you can see all over Seoul and spot the other main towers like N Seoul Tower and Lotte Tower. The aquarium and tower are great to visit for children of all ages, accompanied with their parents. The aquarium is open daily from 10 am till 10 pm and is one of the top things to do in Seoul with kids. It is recommended to go in the late afternoon, so you can enjoy the sunset on the top deck. Tickets can be bought on site, but sites like Klook sell discounted foreigner tickets. Dubai aquarium is one of my favourites in the world. One of the reasons for this is because of the sheer scale. Located in the main Dubai mall, the aquarium can be combined with a trip to the Burj Khalifa and Dubai fountains. Although the tunnel tank can be viewed from the mall without paying admission it is worth getting tickets to do the tunnel, underwater zoo and behind the scenes! The tunnel tank is over three floors and is the most impressive tunnel I’ve ever been in! Other highlights including seeing the giant crocodile and also the penguin tank! There are also hands-on touch pools and behind-the-scenes talks where you can feed the fish as well as a lovey aviary exhibit! Tip: buy your tickets upstairs at the underwater zoo rather than the main desk to beat the queues! Even if Manila is said to be a dangerous and dirty city, where you do not have much to do, I have a different impression after visiting it. I think that if you carefully choose your itinerary, you and your kids can have pretty much fun in the capital of the Philippines. One of these activities is a one-day visit to Manila Ocean Park, the first water park in the Philippines. You don’t have to book online tickets in advance, just show up at the counter with your kids and choose a package from the few available. I chose Sea Breeze Express that includes 11 activities and tours, of which my favourites were Oceanarium, Sea Lion Show and Fish Spa. Aquariums are very large and beautiful, and marine life will not disappoint. You can see sharks, all kinds of fish, jellyfish, sea cats and other colourful and spectacular creatures. There is also a tunnel through where you can pass, and where you can admire these creatures. Besides that, Manila Ocean Park also offers a shopping area with souvenirs, but also food court if you and your little ones will be hungry. 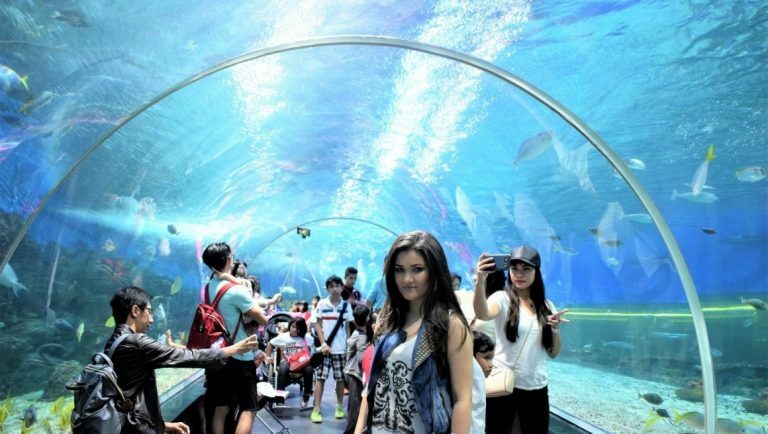 Manila Ocean Park is definitely one of the most beautiful aquariums to visit. 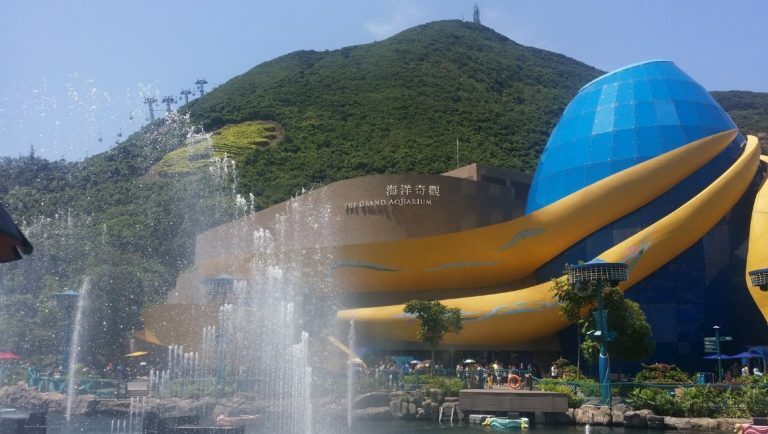 Popularly known as a marine life themed park, Ocean Park Hong Kong also has aquariums that are fit for families with kids who love to learn about sea animals and the underwater world. Although there are smaller aquariums throughout the different zones within the theme park, the piece de resistance is the Grand Aquarium at Aqua City. It features a large aquatic dome, reef tunnels, shallow pools, and a massive 13 meters acrylic panel where you can see a myriad of marine life of over 400 species. It offers a multi-sensory experience and a glimpse of the life beneath our seas and oceans. Kids will for sure love watching the starfishes and seahorses on display, as well as the quite active octopus. It was also fun to see the corals and the sea life along the reef tunnels. The giant viewing panel actually reminds you a bit of the scene in Aquaman, with different kind of sharks and manta rays swimming around. Should you get hungry but still can’t get enough of the aquarium, you can dine at Neptune’s restaurant where you are still able to view the main aquarium as you eat your lunch or early dinner. If you’re still inside Ocean Park until closing, don’t miss out the highly entertaining show called Symbio, which is a 15-minute multimedia show and the world’s first 360 degrees water screen show at the Aqua City Lagoon, just outside of the Grand Aquarium. 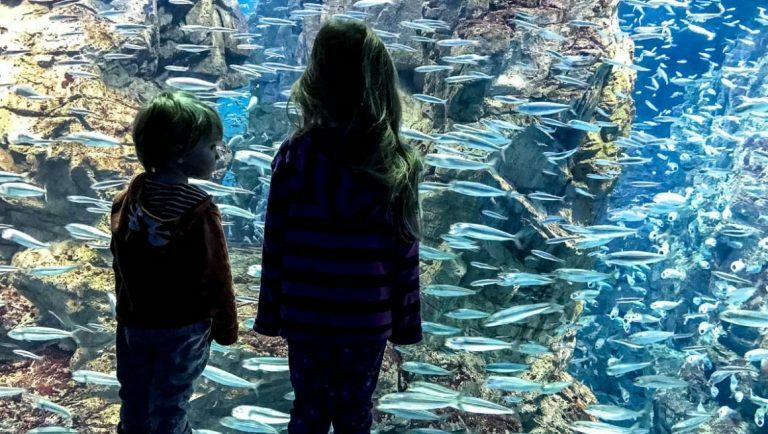 Although none of these cool aquariums make the TripAdvisor top 10, they are no less important and are making this list of the best aquariums to visit with kids even better. The Sealife Aquarium should be on top of your to do list if you are travelling to Melbourne with kids. One of the best aquariums in the world, Melbourne Sealife is located on the Yarra River in the centre of the city, and you can’t miss it’s grand entrance. The Aquarium had a massive facelift in 2013 where its refurbishment cost a staggering $8million! As a result, Melbourne Sealife boasts many new exciting features. Wonder through the glass viewing tunnels discovering the underground world and 12 zones of discovery. Get up close to tropical fish, turtles, sting rays, sharks, and other marine animals, and observe the amazing penguin playground. Come face to face with one of Australia’s largest saltwater crocodiles, Pinjarra who is five metres long, and weighs 750kg! If you dare try one of the Melbourne Aquarium’s unique experiences which include gliding along the glass bottom boat, or swimming with the sharks! Melbourne Sealife is not to be missed! Reef HQ Aquarium is the largest living coral reef aquarium in the world. Owned and operated by the Australian Government, it is situated on Ross Creek in Townsville, North Queensland. 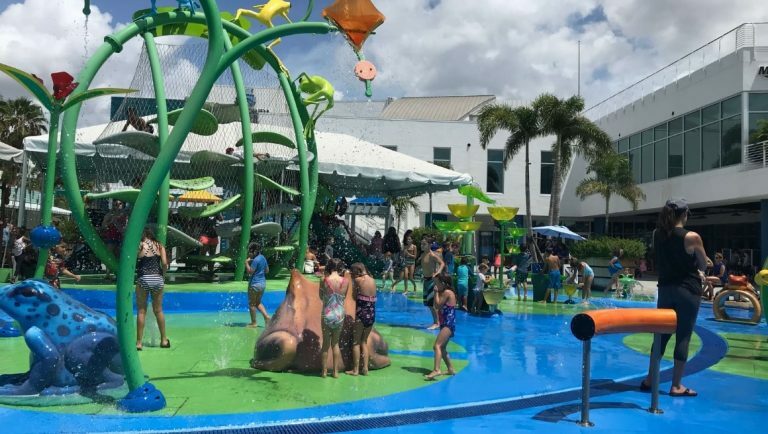 The Aquarium’s primary use is as a National Education Centre for the Great Barrier Reef Marine Park Authority, but it is also a much loved and fun thing to do in Townsville. The Centre has a 5 metre deep, 2.5 million litre living coral reef exhibit with an impressive 150 species of fish and 120 species of hard and soft corals unique to the Great Barrier Reef. 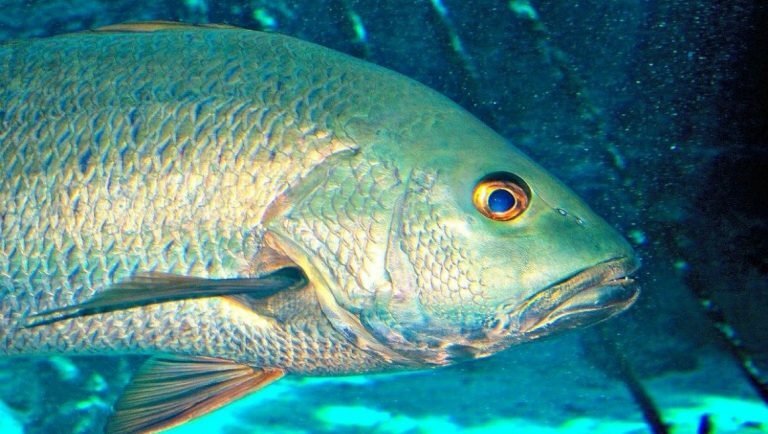 While reef sharks and giant trevally prowl the depths in a dedicated 750,000 litre Predator Tank, smaller species go about the business of living within a coral reef ecosystem. Soft corals sway with the waves while colourful fish dart in and out. It’s a mesmerising sight and it’s easy to be drawn to the seating provided in front of the huge viewing windows. The aquarium also houses a Hospital for rescued turtles, the majority of which are Green Turtles. Having ingested plastic bags and fishing lines in the ocean, the turtles are nursed back to health, in a series of individual, above-ground swimming pools. Reef HQ caters to all age groups and abilities. Children can learn how to reef walk safely in a twice-daily Discovery Lagoon Session and they love joining in the supervised hands-on sea star and hermit crab experience. There are four other talks and tours each day that children of all ages will enjoy, plus visitors can wander freely around the two-storey complex. Interactive displays and storyboards provide interesting facts or you can pick the brain of the well-informed volunteer guides. Reef HQ has dedicated School holiday programs and cost saving family tickets. With an on-site café and souvenir shop, it’s easy to lose yourself in the whole reef experience for a couple of hours. Even though it’s very small, Kelly Tarlton’s Sea Life Aquarium is the only aquarium in New Zealand. So, if you have kids who love an aquarium, this will be your only option. But despite its size, the aquarium packs a lot and is a really nice one. The information sessions are great and they’re entertaining even for the small kids. Just make sure you arrive around 10 minutes prior to the scheduled time to get your kids to the front. The playground is amazing for kids of all ages, but there are some dark parts and the smaller ones may be scared by them. The favourite place for most is the shark tunnel, where you can see not only sharks but different lobsters, manta rays, crabs and even sea turtles! 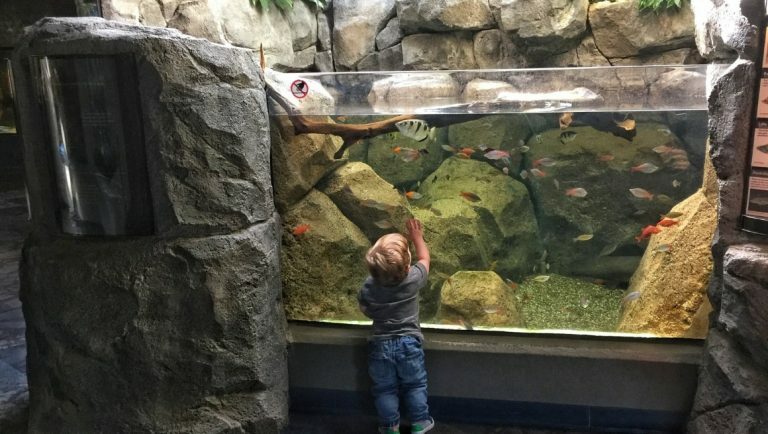 Kids of all ages will enjoy this aquarium, from the littlest to the teens. There are buses from downtown Auckland (they’re buses in the shape of a shark) to the aquarium for free! It’s right in Mission Bay, one of the best beaches in Auckland for kids, so if you’re there during summer, don’t miss the opportunity for a swim! Sea Life Aquarium in Sydney, Australia is one of the best tourist spots in the city. 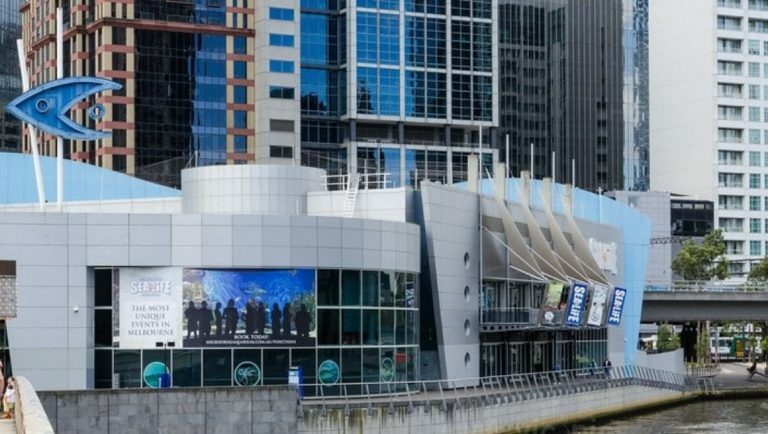 Located in Darling Harbor, this aquarium is huge with more than a whopping 700 species of sea animals in it. It is also one of the very few institutions that house a Dugong. There is a Shark valley and a Shark walk that will blow your mind. Kids right from toddlers enjoy the shark display even more than feeding the fish here and would love to visit the aquarium more than once. Glass walls cover the top, sides and even the bottom at places. You walk on the glass floor surrounded with glass walls where the sharks majestically roam within them. It is truly amazing experience even for adults. Sydney’s Sea Life Aquarium has one of the largest coral reef exhibits too. There is also the notable glass bottom boat tour here to blow your mind if you are still not amazed after the shark exhibit. This boat tour is for ages above 4 and is for about 30 minutes above the tank, it has a separate ticket but includes the aquarium admission. When you buy tickets just for the aquarium or for the glass bottom boat tour, buy them online to get significant discounts over the at-door admission prices. Although the continent of Africa is more famous for its safari’s and the chance to see the big five, it is home to some aquariums, mainly located in South Africa. Two Oceans Aquarium is one of the most respected animal care institutions in the world. As the name implies, it is located in between two oceans – the Atlantic and Indian Oceans. And in its scenic Cape Town, South Africa scenery, Two Oceans Aquarium highlights the rich marine diversity in the Western Cape region. Kids of any ages would enjoy the Two Oceans Aquarium. At the entrance of the first exhibit, younger kids can say hi to many clown fish – after all, who doesn’t like Nemo the clownfish? And the exhibits inside the Two Oceans Aquarium are both entertaining and educational. Kids can learn anything from the Kelp Forest, sharks and sea turtles exhibits, to African penguins, which are native to the South African beaches. One of the most unique things to do here is to join in the Diving the Two Oceans Aquarium program, which offers a different perspective and view of any aquariums. Kids love this, and even better, if kids see their parents behind the thick acrylic walls with the fierce but docile rugged tooth sharks! 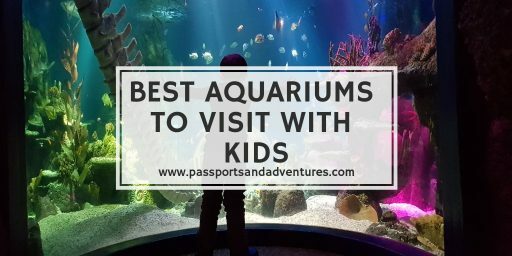 I hope you have enjoyed this list of some of the best aquariums around the world to visit with kids. 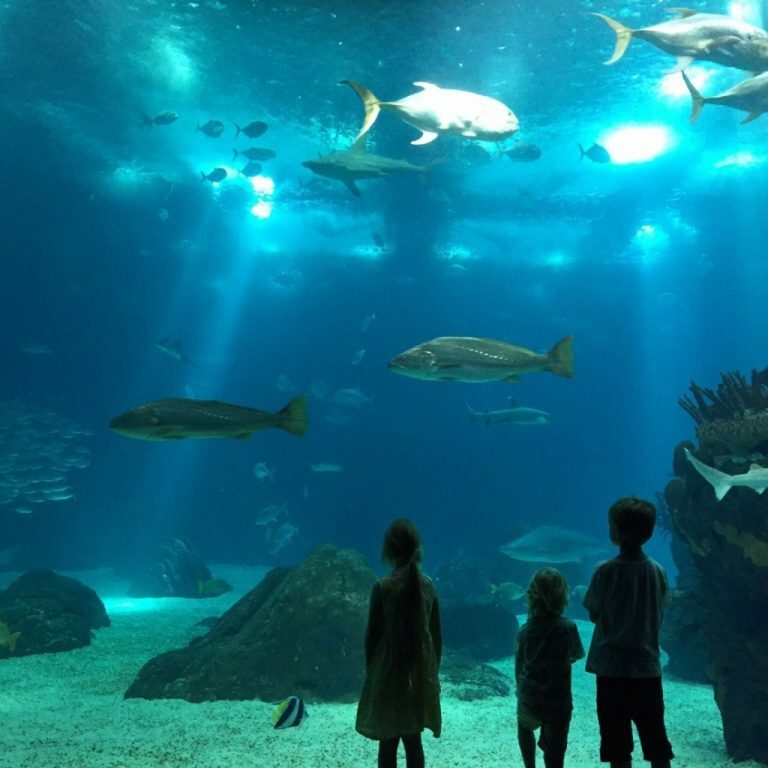 From top aquariums in the US to some of the coolest aquariums to visit with kids, this list is by no means exhaustive but showcases aquariums which are highly rated by those who have visited themselves. All are family-friendly aquariums and will be enjoyed by those visiting with young kids especially. Are there any you would add to this list? Let me know in the comments. 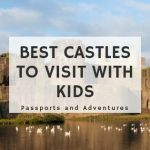 And if you are looking for other family-friendly things to do in cities around the world, why not read my post about the best museums for kids (HERE) or the best castles to visit with kids around the world (HERE). Not sure which are the most family-friendly cities in the world, then check out this post. For more tips on travelling with kids, or destination information, head back to the homepage. These all look like so much fun! We never went to aquariums much, but I did visit Nausicaa in France a couple of times and loved it! We love a trip to an aquarium and have been to a couple in the UK. I had no idea there were so many around the world. They look fab! So many amazing aquariums to go visit. I’ve only taken my eldest to one when she was small. Probably time it took them all to one that’s local. We’re so lucky to have Monterey Bay Aquarium just a short drive away from us. It really is such a stunning aquarium and the kids love the Finding Dory connection! The only problem with having such a great aquarium nearby is that it makes every other aquarium we visit pale in comparison – but we always love a good aquarium visit when we travel no matter . Another great aquarium option in San Francisco is at the California Academy of Sciences – my favorite museum ever! There are the regular aquarium exhibits like those you see all over the world, but my favorite is the Amazon rain forest exhibit. An elevator that takes visitors from the tree tops all the way down to the flooded Amazonian forest floor below. There is a big tunnel to walk through with giant fish swimming around the tree trunks above. It’s such a surreal feeling looking up! This is such a great list! Definitely keeping the rest of these in our back pocket. Our son loves the aquarium whenever we travel. The fish look great. The kids love going to the aquarium. This is brilliant what a comprehensive list. I’ve been to the one in Sharjah (UAE) but I’d rather watch the animals while diving or snorkeling to be completely honest… any thoughts about that? I completely understand where you are coming from and, while I do agree it is better to see animals and fish in their natural habitats, I do think aquariums are good for starting to teach young children who cannot go diving or snorkelling yet about the oceans and the things that can harm them and what we can do to help. Our son was fascinated (aged 4) with the plastic display in the Oceanario de Lisboa last year and it was a great way to explain what it was about, and why we need to watch how we use plastic and, if we really need to use it, how to dispose of it as best we can. Aquariums also help people like me, who have a fear of the sea and open ocean to get a glimpse into fish I would never otherwise see. 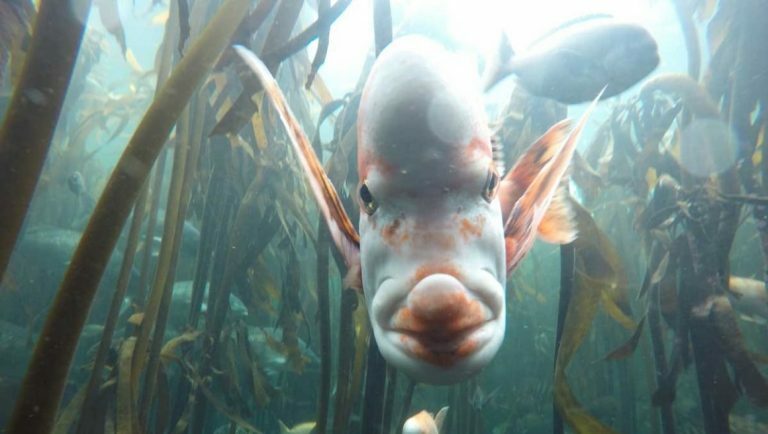 Despite being a very good swimmer I’m petrified of the sea and will never snorkel or dive in it, as much as I’d love to see fish in their natural habitat. Many of the aquariums we also visit are not just about being a display or spectacle, they are also focal points for conservation and education. What an amazing list! 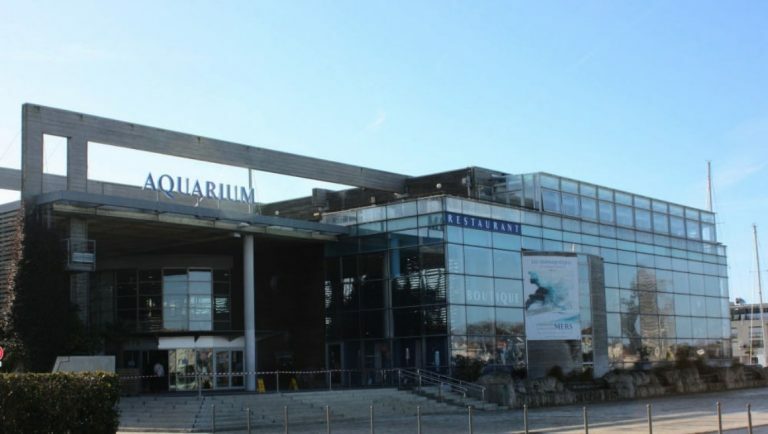 I live in Plymouth and we’re very proud of our National Marine Aquarium – I even used to work there in my student days. Now we’re regular visitors as it’s so family friendly. A great morning out with other mums. My boys love the sharks! I love aquariums but I’ve never been to any outside of the UK, I’ve never even been to the London one. I need to add these to my bucket list. What a great round up. We have also been to the Barcelona Aquarium and the one in Toronto. I am hoping to make it to the Vancouver one this year as we are there for a family wedding. What an amazing round up! 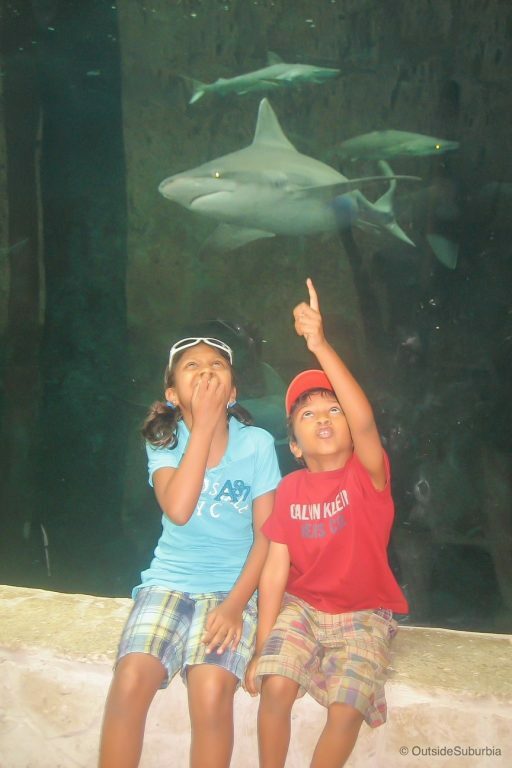 We love to visit aquariums too, my kids never grow tired of them! Absolutely loved this collab idea. This is a true gem for people traveling with kids (and adult-kids like us). Glad to be a part of this massive round-up. Lovely! Only been to the London aquarium but we have the National Geographic Odyssey here in NYC which is all CGI but you feel like you’re in the literal ocean…especially with 3D glasses. Amazing! Osaka Aquarium is incredible, it definitely gets my vote. I’dd at S.E.A Aquarium in Melbourne to the list, I actually thought it was more comprehensive than the Sydney offering – my kids really got a kick out of the Gentoo Penguin exhibit! Wow! What an amazing list. I have been to a couple of these aquariums and you are right, they are pretty amazing. The Atlanta Aquarium is a favorite of ours and we make it a point to visit each time we are in Atlanta. There is one in New Orleans, LA that is awesome for kids, too. I do enjoy scuba diving and snorkeling and that is the best aquarium of all. I have only ever been to a few aquariums in my life, but you have visited so many! I would love to be able to visit more of them. 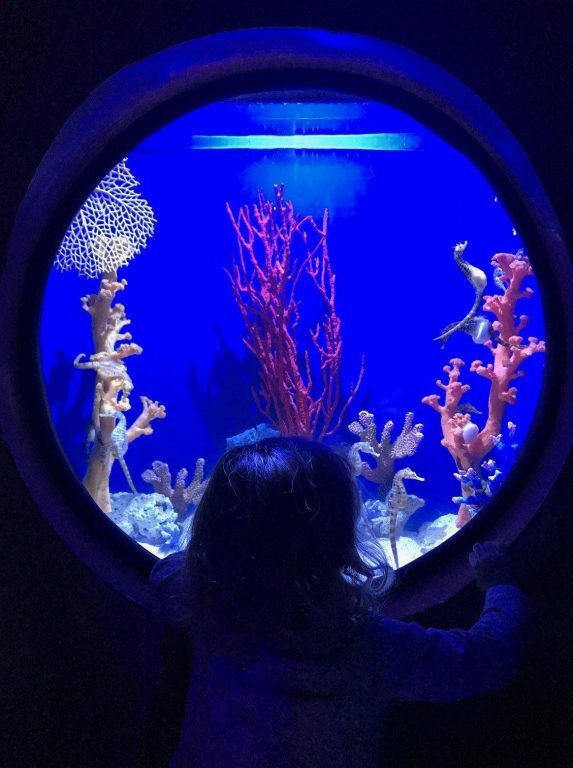 I think my favorite photo was the one with the three children in front of the aquarium glass, but it looks like they are standing inside the tank! Thanks Luke, but we haven’t visited all of these ourselves. 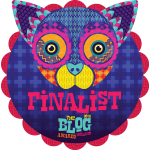 This post was in collaboration with my fellow bloggers. I wish we had visited all of these!